“A gift is often a curse.” Like #Hulk’s superpower. Does #Magneto’s daughter have any of his powers? #Cyclops splits #ProfessorX’s favorite tree in half. Instant enrollment. #Magneto’s daughter recreates Hitchcock’s #TheBirds. Love the #TOS #StarTrek scene on TV. #WhoMournsForAdonais? A rare non-comedic #StanLee cameo. After losing his family, #Magneto breaks bad. #JeanGrey #MindMelds with #Wolverine. She soothes the savage beast. Final analysis: an entertaining yarn despite its slow pacing. Some memorable moments and cameos. Rating: 3 out of 4. The best of the new cast #XMen movies. A more cerebral superhero film. Thank the Maker! In case anyone hasn’t noticed, we’ve had three superhero showdowns within the last three months. First was the titular title fight in Batman v Superman: Dawn of Justice (in late March) followed by Captain America and allies vs. Iron Man and his cohorts in Captain America: Civil War (in early May) and now we have the epic confrontation between Professor X (James McAvoy) and his mutant students vs. Apocalypse (Oscar Isaac) and his cadre of brainwashed fiends in X-Men: Apocalypse (in late May). The fact that all three of these heroes-fighting-heroes movies were released during an election year is telling of a country divided along ideological lines and facing its most critical challenges in its 200+ year history. 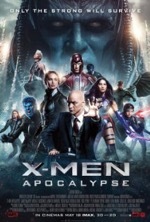 This movie is a sequel to 2014’s X-Men: Days of Future Past and is the third featuring the young cast (McAvoy’s team rather than Patrick Stewart’s). The film is directed by Bryan Singer; this is his fourth time at the helm of an X-Men picture. The script by Simon Kinberg clearly caters to fans over non-initiates as the narrative is laden with references to the comic books. The story itself is quite dense, juggling multiple characters and storylines for nearly two and a half hours—twenty minutes too long for my taste. Despite being a cerebral film with much to say about the current state of humanity, the story is riddled with problems. First of all, the film is embarrassingly derivative. Besides evoking both Stargate (1994) and The Fifth Element (1997) in its “Aliens Visit Ancient Egypt” opener, it also pilfers story elements from earlier X-Men films, a la the climactic confrontation between Professor X’s initiates and Apocalypse’s minions, which is similar to the clash of mutants at the end of X-Men: The Last Stand (2006). Also, villains using Cerebro for their own nefarious purposes is nothing new either: reference X2 (2003). Magneto disrupting Earth’s magnetic poles to create mass destruction is just a larger scale cataclysm of the stadium drop in the previous film. Indeed, Apocalypse’s plan to remake the world to his design is similar to Lex Luthor’s (Kevin Spacey) dastardly plot to wipe out the Eastern seaboard by dropping a kryptonite-infused island into the Atlantic Ocean in Superman Returns (2006), an earlier Singer effort. Not all is lost here, as several topical storylines make this a worthwhile entertainment—apart from its mind-blowing action sequences. Since his design is to destroy the planet as we know it, Apocalypse is a type of terrorist leader. The scene where he rounds up the world’s nuclear arsenal and tosses it into space generates ambivalent feelings since we’d be safer without them so long as someone like Apocalypse doesn’t show up on our world. The destruction caused by the Apocalypse influenced Magneto also taps into 9-11 anxieties and the prevalent feeling (reflected in the rise of dystopian literature and media in our society) that an earth-shattering event is in our not too distant future. Ultimately, the two highest yield plot elements are Jean Grey (Sophie Turner) overcoming her fears and unleashing her mental fury—a girl power sequence that rivals Rey (Daisy Ridley) arming herself with the lightsaber and confronting Kylo Ren (Adam Driver) in Star Wars: The Force Awakens (2015)—and Magneto (Michael Fassbender) breaking bad after his family is accidentally killed. The scene where Apocalypse takes Magneto to confront his past at Auschwitz is another deeply affecting scene with some tremendous acting by Fassbender, who delivers the movie’s standout performance. This brings up an interesting question about the franchise’s decorated ensemble…how long will McAvoy, Fassbender and Jennifer Lawrence stick around since their superstar status has afforded them more attractive and challenging roles than anything Marvel could hope to offer? And for that matter, how many more X-Men films will the forty-seven year old Hugh Jackman (who briefly appears here as Weapon X) make? Even though this is the finest of the new X-Men films, it still doesn’t approach the quality of the first two films in the series. Still, compared to the typical comic book film, the X-Men films are like Shakespeare by comparison. Oh, and on a side note, the next film will be the tenth in the franchise. And you know what the Roman numeral for ten is.